My clothes sticking to my skin, sweat stains starting to build up under my armpits, down my back and across my tummy, I sat on my low stool, continuing to drink water at a small roadside motorcycle workshop in Vietnam watching my Honda SS50 1967 motorcycle be taken apart numerous amounts of times as they tried to figure out why it was overheating. The family, who owned the primitive shop, handed me one bottle of water after another until I eventually just couldn’t hold it in any longer. I approached the mother of the household and squatted down in front of her, making the sound of peeing while doing so, hoping like hell she would understand me so I wouldn’t have to repeat this embarrassing action a second time. The thin wiry woman nods and I sigh in relief. I follow her past my motorcycle and into a room just off the main area, which is now being used as a workshop but after hours converts into a living room and then later into one large bedroom. Just behind two narrow flimsy curtains the women is demonstrating how to use a plastic scoop and the water from a 44 gallon drum in the corner of the room. 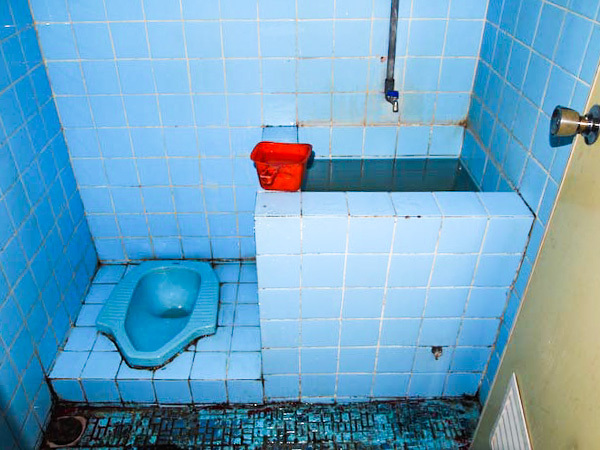 I slowly look around this tiny room, as it dawned on me this wasn’t the typical Vietnamese bathroom. This was in fact their kitchen. Horrified, I quickly repeated my silly pantomime of wanting to pee hoping she would realise her mistake and drag me down the back of their property through the pig sty to where the long drop was normally situated. But no, she quietly nodded and repeated the action and then left the room, closing the curtains behind her. Dread overcame my body. I didn’t want to pee on this nice family’s kitchen floor, amongst the pots and pans. But I know I can not hold on any longer and I had no idea how long fixing the bike would take. I could only see one way out of my pressing dilemma and that was to try and aim for the small gap between the concrete floor and the tarpaulin wall. I pulled my pants down, positioned myself as close to the wall as my knees would allow. I was concentrating so hard, hoping my pee would do as it was told for once! I found myself frozen in fear of missing my bulls eye and rendered unable to even pee. “Ok, Danielle” I mumbled to myself “Just relax, just…relax..” All of a sudden I relaxed enough and like any normal girl, my pee didn’t behave and sprayed everywhere but where I wanted it to go! I went into quick recovery mode and washed the floor down, trying to make sure I had washed everything. Once I was finished, I stood up and turned towards the doorway, discovering that during this whole process, someone had opened the flimsy curtain between the two rooms and everyone had watched the whole show! When planning a motorcycle trip, the thought of “How do I go about urinating in public?” comes up. It’s easy for a man, to get off his motorcycle, unzip his fly and start peeing. In fact in India, you will be a witness to many men doing their business on the streets and if you’re not careful you will end up standing on small golden nuggets all over the footpath! I am sorry, but for women, it’s just not that easy. We are just not designed to do our business in public without showing off what our mothers gave us! Some countries it’s a normal sight to see a car stop on the side of the road and a woman leaps out and makes a dash into the fields, but there are also a few countries around the world, that women should take a lot of care in not been seen at all. TIP: Every country is different. When I enter a country, I observe the local culture and the women’s behaviours so discover how I should behave and act. By doing this not only do you learn more about the subtleties in different cultures but also how you should go about your business. Below is a brief outline on to some etiquette (or not so etiquette in some cases) in a few feature countries that I do think you should take note of. Remember always take note of how the local women behave around you and you can never go wrong! Laos – Women tend to pee in public without even lifting up their sarong. I never could work that one out. You would have seen it many times before realizing you were actually witnessing a private moment! Russia – Just stop your vehicle and do you business! There is no shame! Mongolia – You will notice a people squatting down just outside the stone ring around their gir (traditional Mongolian house), but with their huge warm coats you don’t actually see what they are doing, but suddenly you will realise they are just going about their business. India – Despite the amount of men you will observe stopping in front of you to squat to take a leak, you will never see a women do so. You will find it hard to find a quiet spot that lacks people. If you do find one, and you want privacy then hurry! Believe me it doesn’t take long and you will be surrounded and watched. Islamic Countries – Take care in all Islamic countries to never be seen. Men will bend over backwards to help you find an adequate bathroom. Or just make sure you are well hidden. These are pretty tricky when you’re not used to them. After some time, you will master the art and maybe just maybe you will start to prefer these toilets. In a general comparison and despite the lack of toilet paper there is normally water everywhere which if not careful you can end up with soggy trouser legs! These toilets are far cleaner than the standard western toilet in these countries. So be careful what you wish for. TIP: Don’t want soggy trouser legs? Before you drop your pants, you have to first pull them up! Sounds funny, but you just need the cuffs to not drag. This simple trick will stop any uncomfortable and embarrassing moments. Every paperless toilet is different and even back home sometimes you get caught short. But first you think of using your knickers, hand towel, and if you are the sensible people who don’t have a cactus in the toilet the leaves of the closest living plant crosses your mind. Well actually the latter option, isn’t a bad one but for most of the world, paper isn’t an option and the only thing you will discover in the room is a pot of water. What now? Using water and only water! Another dread for the standard western culture, but after you get over the icky feeling you actually discover it works better than you even dreamed of! TIP: Foxgloves and Lambs Ears are two great plants to substitute for toilet paper. They both are soft and flexible. Just make sure you check it first for any unwanted friends! Just remember – Right hand is for food and your left hand is for… and NEVER EVER use your right hand to do your dirty work. Most countries where they have paperless loos, people also generally eat with their hands. So make sure you don’t end up offending anyone or getting seriously ill yourself by mixing up the hands! Most paperless toilets will come equipped with a running tap of water or a tank of water and a small plastic cup/scoop or bowl. Before you do your business, make sure you fill the small bowl of water up from the tap, tank or large bucket of water. Then use that water to pour onto the palm of your left hand, then wide your privates clean. Repeating when necessary. Never dip your dirty hand into the main water. To clean your hands afterwards, you once again fill the bucket up and pour over left hand. Rubbing your fingers together to cleanse them. Sometimes there is just nowhere to go, but you do not want to expose yourself to the world. Well, luckily for us ladies, some people have come up with a clever invention that can help us out. I was fortunate enough to be sent some samples to test out while I am travelling in Africa. Below is my opinion on reviewed products. First off, I spent one month using these devices when I went to the toilet at home. I never practised in the shower, however sometimes I wished I had! The biggest hurdle I found I had to get over, was the feeling of peeing itself. Once I had learned to relax I could follow through. Please note: Around the time of my field testing it was a generally cold and rainy. Therefore I was wearing more than normal. Not only did I have my motocross boots, motorcycle pants and air-cage jacked on. I also had several base layers, a windproof shell and a waterproof jacket. 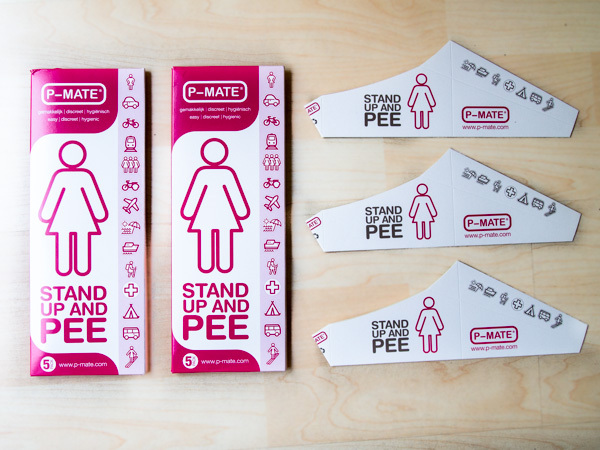 P-Mate is made out of fully recyclable material with a moisture repellent coating. When you first get it, it comes in a handy 5 pack. You can either pop this into your purse as is or take them out and fold them up to fit into any skinny jean! Once you are done, just place it in the rubbish bin as P-mate is fully biodegradable, or pop it into a zip-lock bag for disposal later. When practicing at home on the toilet. I found P-mate the most simple of all to use. I felt entirely safe with the volume and pressure that P-mate can handle. I was looking forward to test it in the field. However, when it came to the punch, I couldn’t pull my pants down far enough to make sure the P-mate sat correctly and didn’t get a kink in the cardboard. Disaster struck and I ended up with soiled undies and a wet leg for the rest of my journey! I’m not saying it won’t work you for, it just doesn’t work my my motorcycle gear and the amount of clothes I was wearing on this particularly cold and rainy day. If I was going to a gig or a concert I would totally be packing my P-mate! This is an excellent product and I just love how it folds up to fit nicely in my Jean pocket. Then when I’m finished with it, I can just put it in the rubbish bin, no need to wait until its dry before putting it back into my purse. P-Mate is perfect for your shorter adventures, but if you are like me and planning on being away from home for a long time. It might be difficult to carry the quantity you may need. The Whiz Freedom, is made out of a soft malleable plastic with a long spout. It is impregnated with anti bacterial, fungal and microbial agents. It is even self cleaning! It has many accessories, like the connecting tube and relief bag. Both which I have heard from other travellers are well worth getting. At first glance, this looked to be the one I preferred. It is made from a soft malleable plastic. Re-usable. The shape itself is formed to the woman’s curves. However, it actually took me a while to master the art in house and to feel comfortable with it. I always felt as if my pressure was going to be too great for the smaller sized funnel and narrow spout. To put this at a level playing field, I was bursting when I finally found a place to pull off the highway. Therefore, disaster struck as it overflowed and dribbled down my leg! I never really trusted myself with the device after that! If you have a small bladder or tend to go to the toilet a lot and only pass smaller amounts of fluid. I would recommend The Whiz Freedom. Personally my body isn’t cut out for it and when I’m in the mood to ride, I hate stopping to pee which generally means I have a swollen bladder ready to breach its banks! The Shewee is made from a hard plastic which has been shaped to cup your undercarriage. It comes with a nice container to keep it in and an extender pipe. Please note: My Shewee didn’t come with an extender pipe. 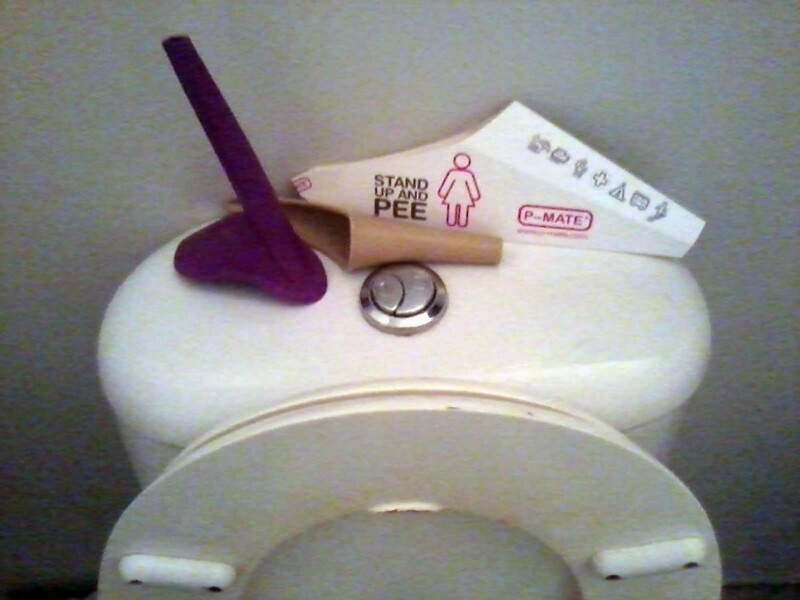 I did all my testing with the normal length Shewee. At first I was concerned that it was made out of hard plastic and the lack of funnel area. However the Shewee surprised me as I discovered it was easy to use, with no accidental overflow! In the field, it stood up to my high flow pressure and all my gear pulling against it, however it just wasn’t long enough to pass my clothes or my boots! Now Shewees come with an extender hose. But also a clear rubber hose would have done the trick. I would love to have the Shewee on any of my adventures if I include the extender hose. My only concerns now is that it is made of hard plastic and does take up precious space in your bags or pockets. I Have wondered how good these deviices were! A really useful trial communicated so frankly Danielle.Happy travelling! Hi Helen, I was also once in your position and wondered about them. I am super glad to help someone out. Just remember, these are just my opinions. I have meet some people who love them.